Basically I felt that hardness was insufficient and strong. The pin part retracted and got stuck in, and the intermediate part of the threaded part was deformed and deformed. After all, both of them were damaged. This review is about item#9318337. 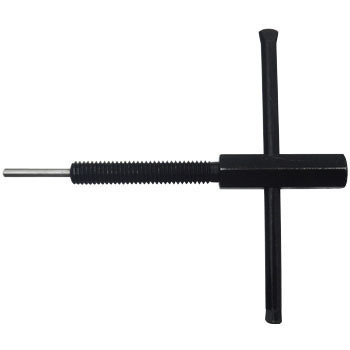 Due to insufficient strength, both the pin part and the threaded part were deformed, making it unusable at once. I used it incorrectly for the leaf chain of BL634 (pin diameter 8 mm), the tip broke like disposable chopsticks. Even if you use it regularly, it may be broken depending on the state of the chain, so you had better have a spare. It takes more time than a knockout cutter, but it can be cut while it is attached to the machine, which is convenient. This review is about item#09318373. Since the tip part broke at the time of chain cut, purchase for replacement. I think that the tip part will not break if the original usage is used, but it broke because it was used in size up. I think that this product situation is a good product. This review is about item#9318355. At this price this strength and making are perfect. I bought the cutter body and the pin was purchased for the first one only as a pin purchase. This review is about item#09318355.